So the last time I posted was just before the last drop. I try to post images on the facebook page as soon as possible after a drop so that if the heart is found there will be some evidence for the finder. If I can't get to a blog posting right away the facebook page is an easy and quick way to check in. I did this drop with my daughters in tow. The two year old was oblivious to what we were up to, but the six year old was beside herself with excitement. What if someone found it while we were there? what if someone saw us "hide" the envelope? What if they asked us if it was ours? All the things that run through my mind when I do a drop spoken out loud and with the barely suppressed excitement of an excited child let in on a big secret. 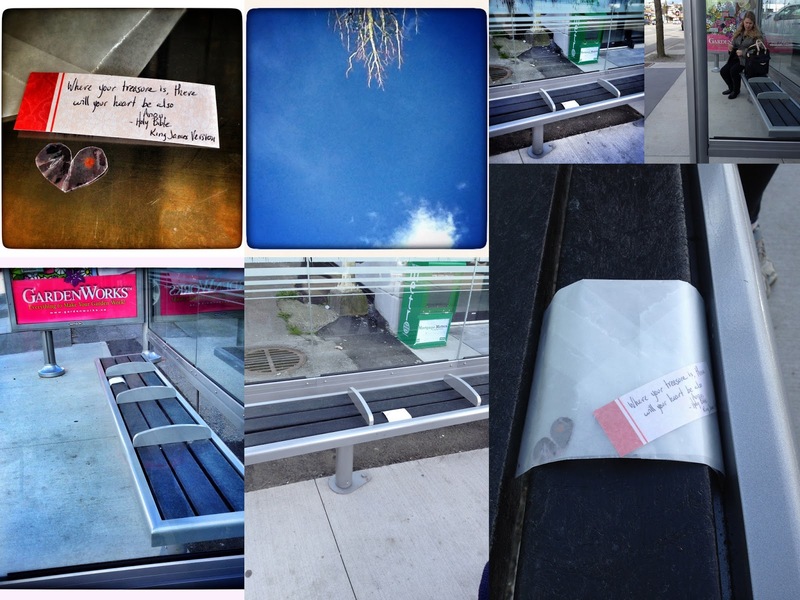 We placed our envelope in the slats of the bus shelter and took some photographs. Then we moved a little ways away to give the drop some distance while we waited for our bus to arrive. We had a bit of a wait for our bus and I didn't want to crowd the drop in case someone did come along. Someone did come along soon after, and my heart nearly jumped out of my chest as I tried to get the six year old to act casual as a woman walked out of the bakery and over to the bench. She sat next to the drop and we were able to watch as she read, but did not pick up the dropped heart. Our bus came and we left for home. I've lingered around after a drop a few times hoping to catch a finding in the act but this was the first time that I've been so close to witnessing a find. Our heart was not there the next day which could mean any number of things could have happened all of which I've listed in other posts here. If you've found your way here from a found heart let me know. Follow this blog and or the facebook page, comment or just come back for another read sometime to see what where I've dropped another heart.